By September 20, 2007, the final lift of asphalt was laid down and the road reopened with lovely wide sidewalks for the high volumes of pedestrians who travel here. A year later, in November 2008, the road surface still appeared to be in good condition. A new multi-unit newspaper box was installed at the corner of Bank and Slater as a trial, but it remains a one-of-a-kind in Ottawa (since nobody wants to own them). The Starbucks is the only surviving business at this location, with the Shawarma Laguna replaced with another mediterranean restaurant, and Stroked Ego having replaced the second-floor Perfection Hair Design & Spa. 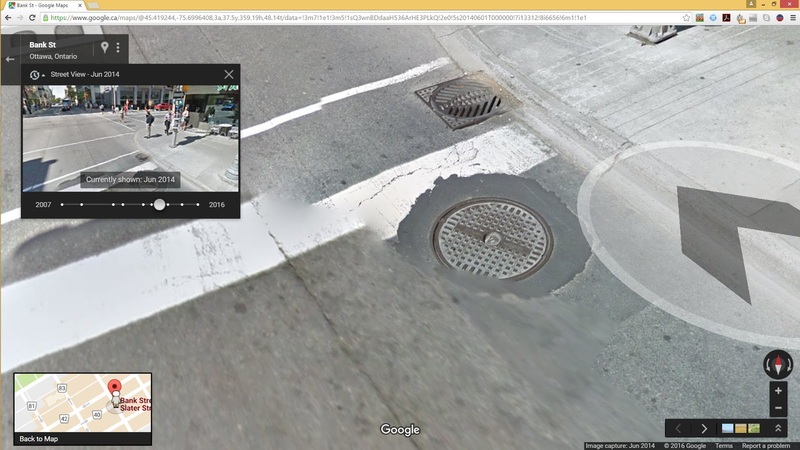 Still in November 2008, we see a circular manhole cover right near the newspaper multibox. By July 2010, some cracks had started to develop around this particular manhole. A lot of traffic goes over this, which can put a lot of pressure on the infrastructure. I can't tell if our manhole is for water or sewer or what, despite being installed six years after amalgamation it still uses the old "Ottawa-Carleton" label. My guess would be for watermain service. 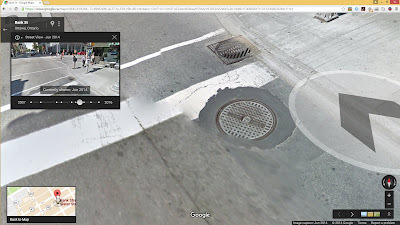 Note that the nearby square catchbasin cover doesn't have any broken asphalt around it. Your guess for why is as good as mine. 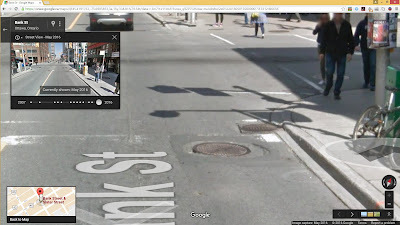 I took that photo in 2010 with the specific intent of keeping an eye on this manhole cover to see how long it would take for it to get to a point where it needed to be repaired, and I've taken photos periodically ever since. November 2011, some pieces of asphalt had fallen out. 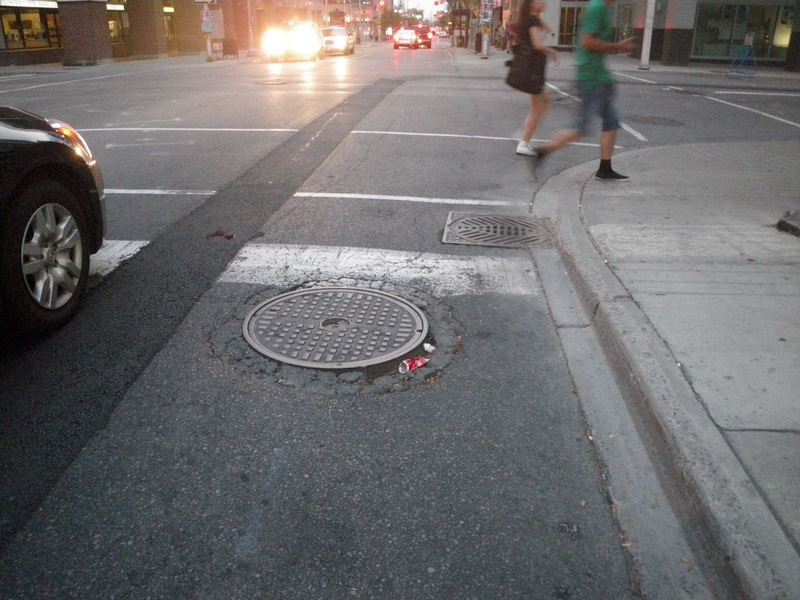 May 2012, even though the hole in the previous photo was filled in, you can start to see the metal ribs on the edge of the manhole lid. 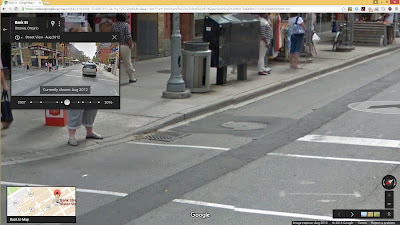 July 2012, the pothole is in more or less the same state, but a Hydro Ottawa road cut has joined it. August 4, 2012, some trash, not much else. This means that the road was built in September 2007, cracks started to developer in 2010, three years after, and it got bad enough to warrant patches in August 2012, at just under 5 years old. This had disintegrated by the next time I went by in May 2015. 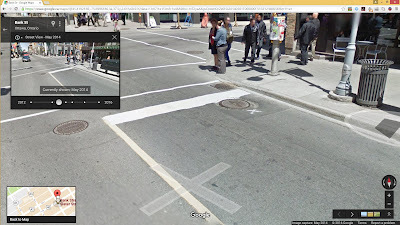 Curiously, the other circular manhole cover just on the other side of the centreline seems to be doing just fine. It would presumably be for a different service and therefore might have a different configuration under the surface that happens to hold it up better. I wonder what those configurations are, and what makes this one so prone to needing repair. 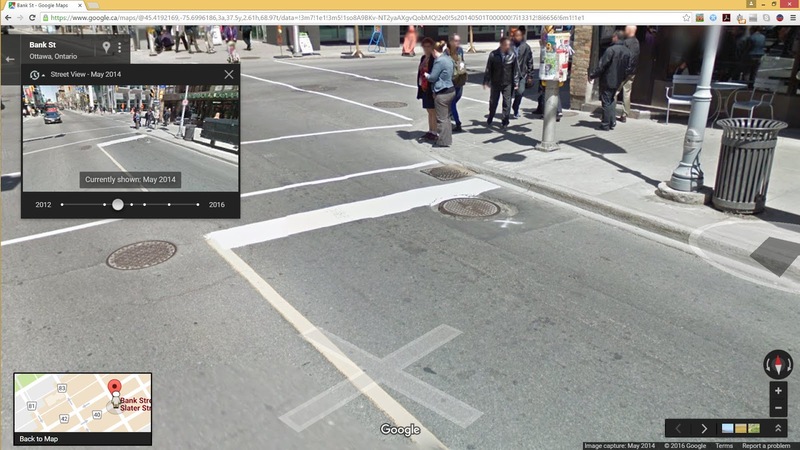 When you look around the intersection in Google Street View, you can see the asphalt around different covers is in different states of repair. 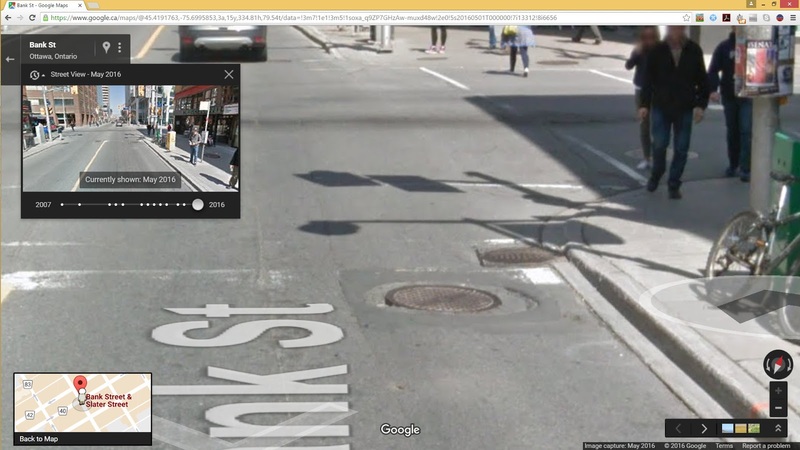 For a less banal history of the intersection of Bank and Slater Streets, see this very thorough retrospective on Urbsite. 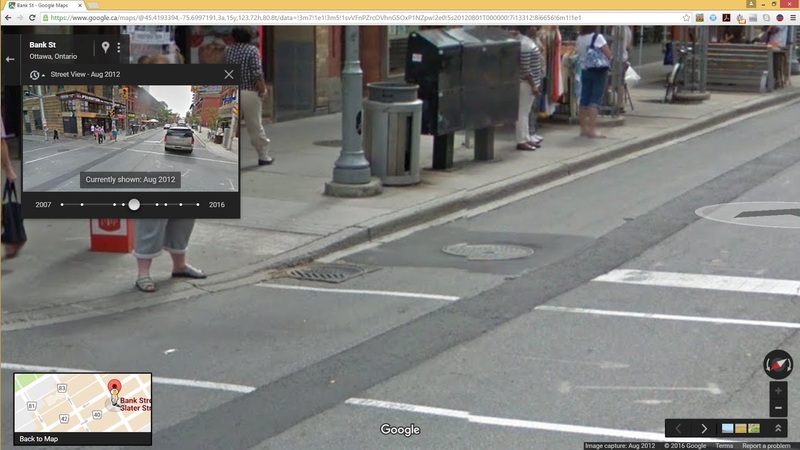 Excellent monitoring and discussion of an issue afflicting all Ottawa streets that seems never to be satisfactorily addressed. Its hard to feel that those who are actually responsible for managing our roads have ever undertaken an equivalent study.